Leonardo Academy helps event hosts undertake emissions footprinting projects to understand, and then reduce their event’s environmental impacts on climate change and air quality. 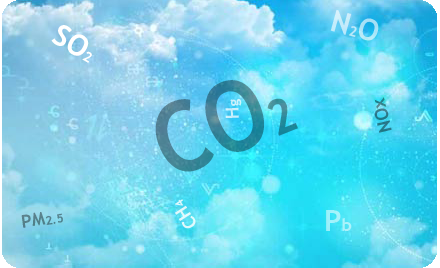 Carbon dioxide (CO2) and other greenhouse gases, nitrogen oxides (NOx), sulfur dioxide (SO2), and particulate matter (PM2.5 and PM10) are only some of the harmful substances caused by the combustion of fossil fuels. Because each of these types of pollution causes its own set of environmental and health problems, offsetting all emissions is vital to environmental protection and personal health. 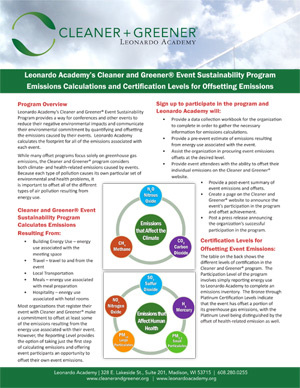 Fill out and return the Cleaner and Greener® for Events emissions certification inquiry form, which can be downloaded below.